On Saturday, 6th April 2019 at 5:15pm, Aintree will host the Randox Heath Grand National, world’s famous race with £1M prize fund. The racing at Aintree begins on Thursday – otherwise known as Grand Opening Day. Friday belongs to the ladies and is called appropriate – Ladies Day. 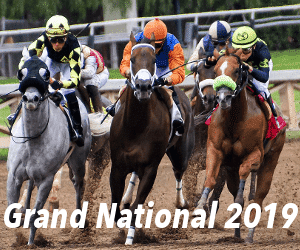 On Saturday, up to 40 horses line up in the Grand National for the event highlight. In this article I will be going over everything you need to know about the toughest of jumping tests in the National Hunt calendar. Below I will be giving preview of all the need to knows, culminating in my best pick for the race. The history of the race provides us with many clues on how to pick the winners at any given price and below are the key points. Younger horses have a well know poor record in the race for many reasons, with speed being much more important than stamina in their early years. The jumping ability of the horses will only improve with age and in my opinion being a good jumper the most important attribute so the younger horses can struggle with this incredible jumping test. We have to go back to 1940 to find the last time that a horse younger than 8 won the Grand National. The peak for a staying chaser is thought to be around 8 – 11 years old. The National trends back this up with all of the last 10 winners coming from this age group. We have to go back to 1923 to find the last time that a horse older than 12 won the Grand National. The weight a horse carries is significant when we are studying the statistical factors of the national With the National being the longest and toughest staying handicap chase this is made even more important. Since the war only seven Grand Nationals have been won by horses carrying more than 11st 5 lbs. Two of those high weight victories were by the incredible Red Rum who was a true phenom and we can’t base our results on him. The trends suggest that horses carrying more than 11 stone 6lbs have tended to struggle. Recent winners have all shown that they are top class horses who have previously run at the highest level. Even the horses who hadn’t won a high class race had all performed well in at least one previously. Rule The World (2018 Grand National winner) had been placed in an Irish National and Pineau De Re had finished placed at the Cheltenham Festival (the highest rated festival in the world). As in all horse racing, having a horse with a good trainer and jockey who are both in good form is very important but not essential. It would be down on my list of key factors when looking to pick a winner. It’s usually best to concentrate on the proven ability of the horse over these factors. There are so many good jockeys nowadays that would be able to nurse a very good horse through to the winning line. Jockeys can win with their first run in the Grand National whereas some of the best national hunt jockeys have never won the race. A perfect example of this was two years ago when jockey David Mullins gave Rule The World the perfect ride to win on his first ride around the Aintree fences. Red Rum was the only horse to win back-to-back Grand Nationals in modern era and Tiger Roll is going to try and replicate this incredible feat. Tiger Roll is the current 5/1 favourite with Betway. By the way, Betway is official betting partner of the Randox Health Grand National Festival. Tiger roll is trained by the great Gordon Elliott, the Irish raider was the second winner of the big race in three seasons. While history is strongly against Tiger Roll, he remains prominent among horses at 5/1 in the ante post betting. At nine years old, he is young enough to win the race again or at least come close and certainly comes alive in the spring as three Cheltenham Festival victories show. He is 2lb higher than when he won it last season and the big question is how much will that weight play a part in the race. For me 2lbs over 4 miles 2 furlongs is a significant disadvantage and at the odds it is very hard to advise. At the odds I would be swerving having a bet as there are better betting opportunities out there with some runners paying you more money for coming in the top 5 than for Tiger Roll winning. Colin Tizzard has enjoyed success over the Grand National fences in recent years, albeit in a different race through Ultragold in the 2m 5f Topham. He has one of the leading contenders in Elegant Escape which is currently priced at 20/1 with Betway, Bet365 and William Hill, while Betfair price is at 16/1 and Paddy Power 14/1 respectively. The seven-year-old Dubai Destination gelding might not have the most stamina laden pedigree that thoroughbred experts look for in a Grand National winner, but he has already proved his endurance. Elegant Escape has made real strides this season culminating in running a very impressive 6th in the Cheltenham Gold Cup. With that trip being at 26 furlongs I believe that Elegant Escape will improve for the extra 6 furlongs and could be a big player come April 6th. Set for his first crack at the big fences next month, Rock The Kasbah is a horse who has never fallen in any race and I’m sure will take like a duck to water at the fences. The Philips Hobbs trained horse won a grade three handicap chase at Cheltenham in November winning by over a length and a quarter in a very classy field containing dower stayers in Royal Vacation and Coneygree. Since that race he only came 6th in another grade three at Cheltenham but was staying on very well at the finish. I think that was an ideal prep run with him not being put up any more weight for the big race which has clearly made his trainer very happy. The Grand national has clearly been his main target for a long time as he was entered into the ballot for last year but just missed out as his handicap mark wasn’t quite high enough. One year on and now it is time for him to prove his trainer and followers right. He has the class, the jumping ability, the small weight to carry, generous e/w odds at 25-1 currently and with all of these things combined should run an almighty race for us.